During Rick Remender’s run on Uncanny X-Force (which, if you have any common sense, you’ll go read right now), there was a portion of the story that dealt with a reinterpretation of the Four Horsemen of the Apocalypse. You had War, a massive minotaur with an axe fetish, Famine was an old drummer soldier from the Confederate era, Pestilence was a geisha that spewed Japanese locusts, and Death came from a rich Persian family and just happened to be able to infest people with smallpox and bubonic plague with nothing but a laugh and an evil wink. Ok, so they’re not a huge reinterpretation, but the idea’s there. The hallmarks of the original Horsemen are all there, just presented in a new way. They were engaging as baddies and as forces of nature, plucked from their respective veils and turned into arbiters of death by resident Marvel supervillain Apocalypse. They may not have all worn togas and ridden horses like this painting by ViKtor Vasnetsov, but they were still recognisable. So what happens when you have three of these rapture-heralding equestrians as a trio of twelve-year-olds, whilst big brother outcast Death runs around as a pale-skinned, angle-faced cowboy with a white suit, terrifying smile and a pair of sidekicks who wouldn’t look out of place at the Hellfire Club? 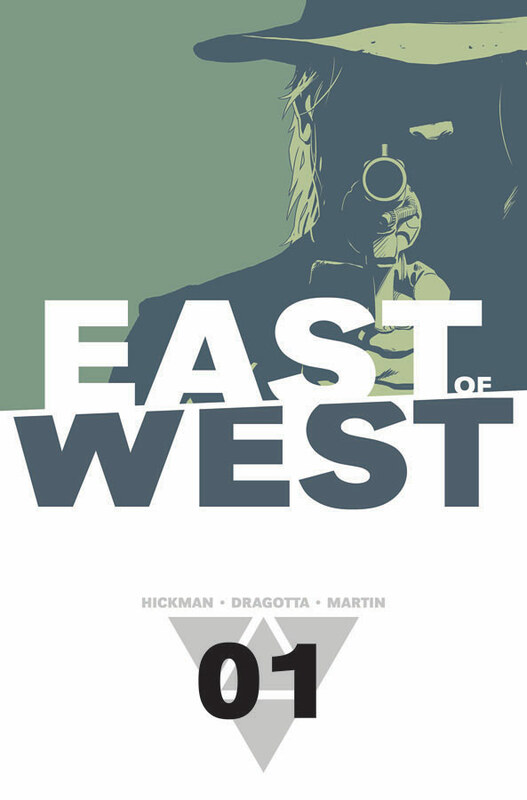 Well, what happens is that you get East of West. The premise, devised by the weird and wacky Jonathan Hickman of current Avengers and Manhattan Projects fame, is straightforward at first blush. Death’s trying to collect some debts from those who’ve slighted him whilst staying one step ahead of his three newly-reborn siblings, who have anger management issues to make the Red Lanterns look well-adjusted. Along the way Death encounters a bartender with an anthropomorphic eye, a Mao-esque empire holding his former love interest captive, and a conniving and possibly completely evil Confederate town mayor with a penchant for naked young women and playing both sides of a conflict. The latter’s kind of like Littlefinger from Game of Thrones if he had a Confucius beard and a Southern twang. Beneath all this surface plot, though, is Hickman’s trademark complexity of character and moving cogs of the greater narrative machine hidden underneath the gloss. Granted, as a first volume there’s only so much The Promise can deliver in terms of character depth and explanation of the setting without devolving into telling rather than showing, but as with Manhattan Projects it seems like this is the setup for a next instalment where things move ahead at double the pace of the introductory chapters. There are plenty of plot teases laid out for Death and his supporting players, and while he’s not as potent or engrossing a character as others Hickman has started writing (particularly Oppenheimer in Manhattan and Black Panther in New Avengers) there’s definitely enough backstory and depth hinted at to make him a potentially great character. The story does get a little misdirected and slows down around the middle with the plot concerning Death’s former love interest, the daughter of a Chinese communist overlord with a fortress to make the North Koreans weep, and while there’s a fairly significant development along that line which comes towards the end of the book (possibly setting up the larger conflict of the series) it comes almost as played for shock value. I won’t spoil it here but you’ll know it when you see it – I’d be interested to hear people’s thoughts on it. 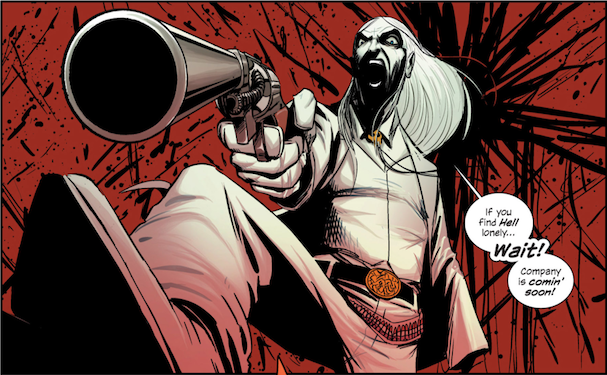 Remember my previous statement about Remender’s Horsemen being a different interpretation on the concept? I think The Promise‘s big development could tie into that a bit here. Artwork by Nick Dragotta is gorgeous. It’s an antithesis to Nick Pitarra’s Manhattan Projects blocky, limited pallet and facial complexity artistic scheme. 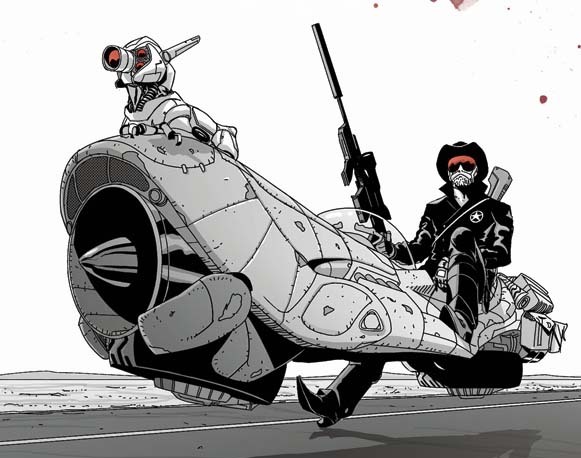 Here we’ve got a fleshed out Western setting juxtaposed nicely with cyberpunk and a bit of urban fantasy, and while the faces don’t have the lines of definition Pitarra gave them there’s still enough shape and difference in them to give them distinct appearances and features. It’s almost as good as the facial work Fiona Staples did for Saga, though thankfully we’re spared the ugly troll scrotum this time around. Dialogue is a bit of a letdown. Hickman has this uncanny talent to convey lots and nothing at all with his words, giving his characters lines that hint at greater explanations of things and provide some clarity without going into anything expository in an almost Grant Morrison-esque way (read The Nightly News and Pax Romana for an idea of what I’m on about). Here, we get the smaller lines but less of the clarification, and there’s an over-reliance on assumption the reader knowing plot points and parts of the setting without them having been explained to us yet. The scenes with the aforementioned bartender with the living eye (which wins the prize for creepiest minimalist artwork of the year) rely on dialogue and terms that we haven’t heard yet, and a framework regarding the bartender’s true occupation that hasn’t been elucidated. It’s hardly a deal-breaker, and part of the book’s appeal does lie in not having everything laid out to us on a picnic blanket, but as Hickman’s dialogue works have gone so far this is a bit near the bottom. It still puts it head-and-shoulders above most other comics writing though – it’s like judging a low-rated Christopher Nolan film against any film by Uwe Boll. 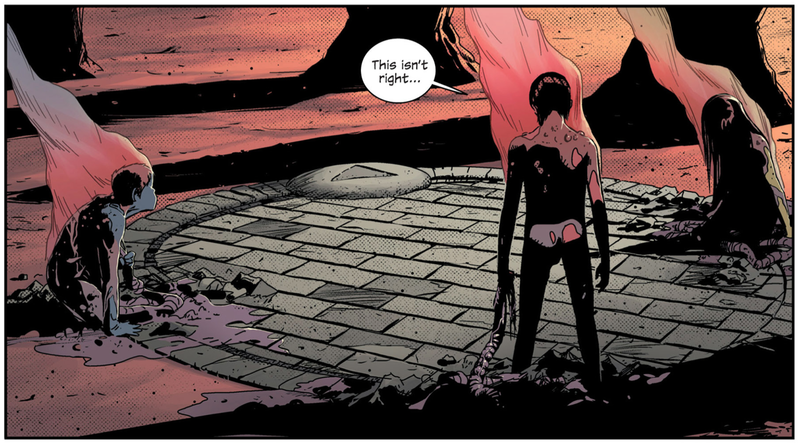 As a beginning, The Promise does enough to get me interested in reading more of East of West. I’m more curious than engrossed at this stage, which isn’t a bad thing – it also happened to me with Manhattan Projects – and I’d be interested to see where we go next. It’s got just enough weird and unpredictability in its makeup that it could be an immensely fascinating story, and given its narrative and artistic heritage I would expect nothing less than a great read later down the track. If nothing else, it’s creative enough that it’ll help wash the taste of DC’s recent failings out of your mouth. As always a really thorough review. Agree with you on the dialogue. Most of it’s pretty forgettable and I found the characters couldn’t really be distinguished through their dialogue. But I find that to be a common failing of most Hickman comics- he uses dialogue to move and expand the plot as opposed to expanding the characters. That criticism aside freaking loved this book especially the whole ‘women who conquered death concept’. Easily one of my favorite Hickman books.